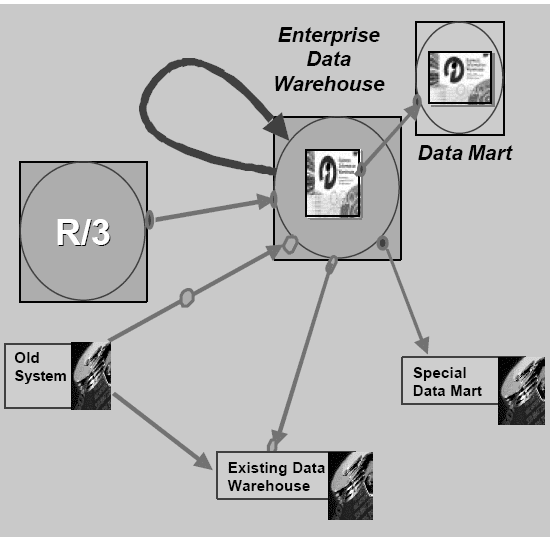 SAP Business Warehouse Data Mart Interface gives some basic idea regarding the following issues.A BW system can be used as a source system for a second BW system.The individual sources of data (data marts) are ODS tables or InfoCubes.A BW system can act as its own source system.The data mart interface allows you to construct simple or complex networks between different BW systems. SAP delivers the extractors for data mart DataSources. Data Marts: What problems do they solve? The company's BW system needs summarized or selected data from a subsidiary company. A subsidiary company needs only certain data from its parent company. Performance problems mean that replicated BW systems are required. You want to construct an InfoCube based on an existing InfoCube in the same system as the original InfoCube. There are many reasons why you use the data mart interface. In the past this interface was used to connect several data warehouses together. The interface has since been developed and now includes the function of linking a data warehouse to itself. The BW systems act as data marts. They send selected information to a central BW system at the company's headquarters. The central BW system supplies itself with information (InfoCube to InfoCube) and also passes replicated data on to a regional branch of the company in a different part of the world. InfoCubes and ODS tables can be used as data marts for InfoCubes and ODS tables in other BW systems. This means that  the source-BW provides the target-BW with InfoObjects and DataSources.  the source-BW also provides extraction APIs for transaction data, master data, texts, and hierarchies. The metadata in the InfoCubes must meet the requirements of OLTP metadata. The name of the InfoCube must be at least one character shorter than the maximum length allowed, because the name of the DataSource is derived from the name of the InfoCube plus the prefix ‘8’. Generated automatically in the background the first time the Administrator Workbench is started after an upgrade or installation. Connects itself to the same BW system: BW is its own data mart. Sends data directly to the ALE inbox (similar to the file interface). The system has no outbox when it sends data to itself. 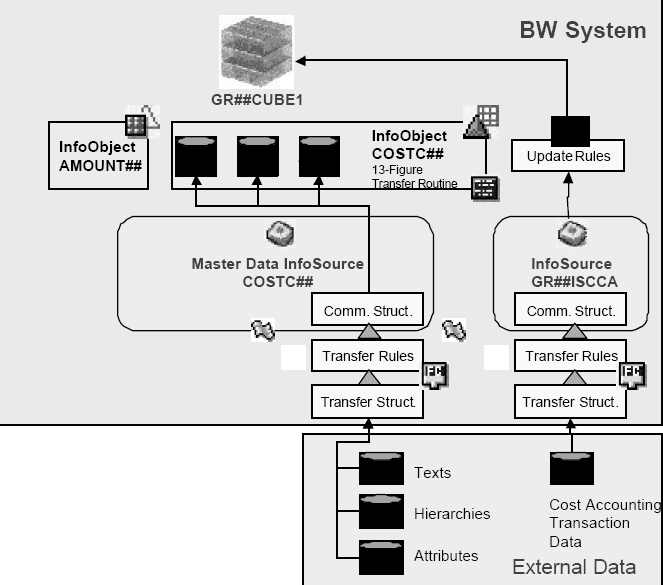 From BW Release 2.0B you are able to connect a BW system to itself.You can fill an extra InfoCube by using an InfoSource to re-import InfoCube data into the BW system.You can, for example, use transfer rules and update rules to cleanse data. With InfoCubes, you have to create a new InfoSource and assign the DataSource manually. The name of the InfoCube must be one character shorter than the maximum length allowed, because the DataSource uses the name of the InfoCube plus the prefix ‘8’ as a naming convention for the DataSource. Usually, export DataSources for master data (characteristic-type InfoObjects) are created when the Generate Export DataSource function is applied to an InfoCube.You can also create export DataSources separately for the various master data tables of an InfoObject. 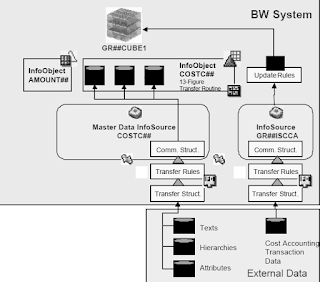 This takes place using the InfoSource for master data in the source-BW. Requests are used to determine a delta. The InfoCube that you want to use as an export DataSource has to be initialized first. This means that it transfers the current status of the data into the target-BW. The next time data is uploaded, only those requests that have been added since the initialization are transferred. You also have the option of specifying various target systems. Restriction: Only one selection allowed per target system for the delta. For example, you decide to select data for Plant 1 and then load the deltas. At a later point, you decide to load a delta for Plant 2 in parallel with the delta for Plant 1. The complete delta has to be requested for both plants, meaning that it is not possible to carry out the deltas separately.